The global flat panel X-ray detectors market is currently being driven by the surge in demand shown by the manufacturing sector due to improving quality check standards. The use of these detectors also reduces the overall need for manpower while increasing production efficiency. The growing demand for electronic products has also led to the growing need to increase manufacturing capabilities, further increasing the scope of demand for flat panel X-ray detectors. The market is also being bolstered by the advancing research and development efforts that are contributing in making the units more affordable. However, the global flat panel X-ray detectors market is being restrained by the increasingly stringent regulatory framework applied to the detectors due to them being classified under radiation emitting devices. The global flat panel X-ray detectors market is being projected at a CAGR of 5.9% in terms of value from 2016 to 2024. The market’s revenue at the end of 2016 was calculated to reach US$1.08 bn and is expected to reach US$1.72 bn by the end of 2024. In terms of geography, the global flat panel detectors market has been segmented into North America, Europe, Asia Pacific, the Middle East and Africa, and Latin America. North America grabbed the leading share in the global flat panel X-ray detectors market for 2015, owing to the increasing use of these detectors in security and bomb disposal services. Their continued use in the above applications as well as the growing use in manufacturing is expected to drive the region’s market further during the forecast period. Flat panel X-ray detectors are also being used extensively in the medical sector. Furthermore, the steady recovery of North America from recession is resulting into increased infrastructure development for manufacturing, putting more focus on the use of flat panel X-ray detectors for quality analytics purposes. The flat panel X-ray detectors market in Asia Pacific is characterized by its growing demand in the emerging economies of India, China, Indonesia, Malaysia, Singapore and Thailand, especially in the healthcare sector. The flat panel detector market in Asia Pacific offers considerable opportunities to global and regional players and is projected to expand at a CAGR of 6.6% from 2016 to 2024, mainly due to the availability of untapped opportunities, improving health care infrastructure, and increasing awareness about modern diagnostics. Moreover, the region is witnessing growth in terms of new manufacturing facilities due to easy availability of workforces in China and India. The use of flat panel detectors to improve production quality is aiding their demand in Asia Pacific as well. By application, the global flat panel detectors market has been segmented into security, manufacturing, construction, semiconductors, and bomb disposal. The manufacturing sector is expected to hold the leading market share over the given forecast period. Other applications in the global flat panel X-ray detectors market lie in the industries of healthcare, automotive, and aerospace, all of which are likely to provide sizeable opportunities to players over the coming years. The leading players in the global flat panel X-ray detectors market so far have included Rayence, Inc., PerkinElmer, Teledyne DALSA, Inc., Konica Minolta, Inc., Olympus Corporation, YXLON International , Toshiba Electron Tubes & Devices Co., Ltd. , Varian Medical Systems, Bruker Corporation, and Hamamatsu Photonics. The report on global flat panel x-ray detectors covers the currents and future trends affecting the market. Furthermore, the study includes an executive summary with a market snapshot which provides overall information of the various segments included in the study. Moreover, the study includes the data analysis of the flat panel x-ray detectors by application and geography. The global flat panel detectors market has been segmented by applications into security, manufacturing, construction, semiconductors and bomb disposal among others. The others applications include medical, automotive and aerospace as the major application areas. With the advent of direct digital radiography (DR) technologies in the X-ray detectors market, demand for flat panel detectors (FPDs) by healthcare institutions and professionals has risen significantly across the globe. Considerable research in the field of X-ray imaging technologies led to the development of direct digital radiography systems. The research has its roots embedded in the development of active-matrix liquid-crystal displays (AMLCDs) for their major use in laptop computers. These AMLCDs constitute an active matrix array which consists of millions of semiconductor components embedded on a substrate. An intensifying screen attached to such an array forms the foundation of flat panel X-ray detectors. These detectors can be utilized in both radiography as well as fluoroscopy. Flat panel detectors offer several advantages over traditional detectors such as image intensifiers, imaging plates, films, scintillators as well as CR or PSP detectors. According to an article published by FlatPanelDR, FPD-based DR systems provide a potential for less exposure to harmful radiations along with improved contrast visibility compared to those with much improved PSP detector-based CR systems. The study also suggested that FPDs performed best with conditions equivalent to those for radiography of the chest and lowest for conditions that imitated radiography of the extremities. Most of the flat panel detection systems or DR systems utilize indirect type (i.e. a-Si type) of FPDs. However, recent research and development efforts have also introduced the direct type (i.e. a-Se type) of FPDs in the global markets. At present, demand for direct digital radiography systems is higher than for any other X-ray systems available worldwide. This would boost the demand for flat panel detectors in the global market and hence contribute towards their augmented growth rate during the forecast period. 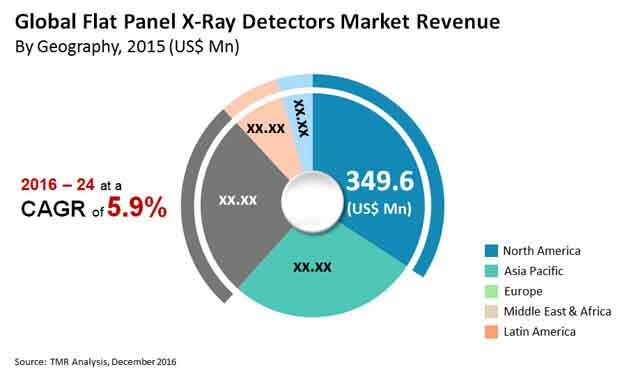 Further going, the key trends impacting the global flat panel x-ray detectors market has also been included in the scope of study. Moreover, the challenges which are hindering the growth of the market has also been focused in the report. The growth of the market has been analyzed with the help of the drivers and the restraints which determine the growth trend of the market during the forecast period. Furthermore, the porter’s five forces analysis have also been included in the scope of the study. In addition, the future scope of the market has been anticipated with the help of market attractiveness analysis. To get a better understanding the product pricing, the average selling price of the various product types have also been included in the study. Furthermore, the average selling prices of DR systems and DR detectors have also been incorporated in the global report. The study tracks the global Flat Panel X-Ray Detectors market in terms of revenue (USD million). The global flat panel x-ray detectors market is witnessing intense competition from the leading players. These players undergo frequent mergers and acquisitions in order to sustain in the competitive environment. The leading players focused in the report include Rayence, Inc., PerkinElmer, Teledyne DALSA, Inc., Konica Minolta, Inc., Olympus Corporation, YXLON International, Toshiba Electron Tubes & Devices Co., Ltd., Varian Medical Systems, Bruker Corporation and Hamamatsu Photonics among others.